Older: Only in America: Quack, Quack! Newer: Red, Hot, and Phew! 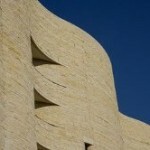 What would you guess is the most popular tourist attraction in the capital city of the United States of America? 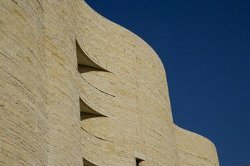 If you said the Smithsonian Institution museums, such as the futuristic Air and Space Museum or the relatively new Museum of the American Indian, you’d be right. But they have a big advantage as a tourist draw, because there are more than a DOZEN of them, including a postal museum; ones dedicated to Asian, African, and American art; two air-and-space museums; and a delightful zoo far from the National Mall in Rock Creek Park. That’s a lot ‘o museums! So we won’t count them as the most-visited site. What’s your next guess? The White House? 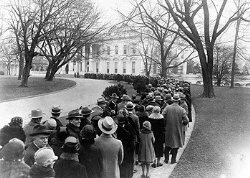 For sure, thousands and thousands of people want to, and try to, get in to see the president and first spouse’s residence, but tours are tightly controlled. You need a ticket, and you have to stand in line. You can’t just walk in and look around. 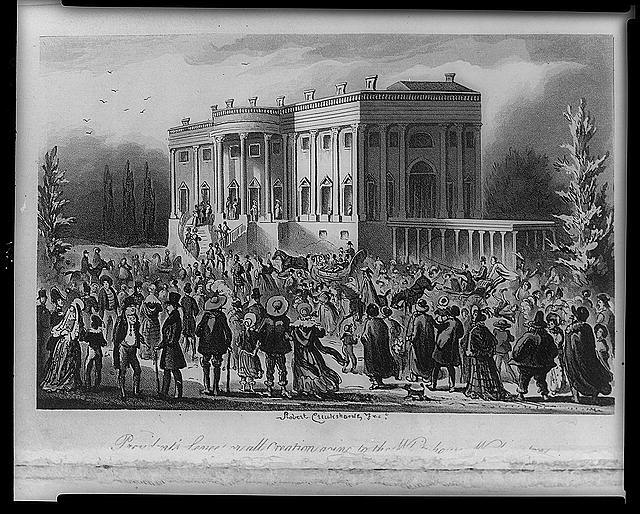 In 1829, Andrew Jackson, a rough-hewn “western” former general from Tennessee — and quite the ruffian compared to the refined incumbent, John Quincy Adams — was inaugurated as president on the steps of the U.S. Capitol, per tradition that continues to this day. 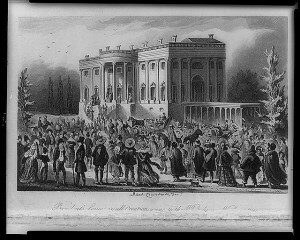 But the crowd did not stop at “hip-hip-hooray” when it came to congratulating “Old Hickory.” The “rabble” — as they’re often described in contemporaneous accounts — followed the Jacksons back to the White House and let themselves in for a good-old bash. Almost crushed and suffocated by well-wishers, the Jacksons escaped out the back door while the likkered-up mob trashed the place, consuming everything edible, smooshing cake into the drapes and oriental carpets, and breaking glassware and antiques. That day’s events, plus steadily increasing security concerns over the years, put an end to drop-ins at the presidential residence. The most-visited single attraction in Washington is Arlington National Cemetery, which is not technically in the city but is literally a stone’s throw across Memorial Bridge in Northern Virginia. OK, a prodigious stone’s heave. 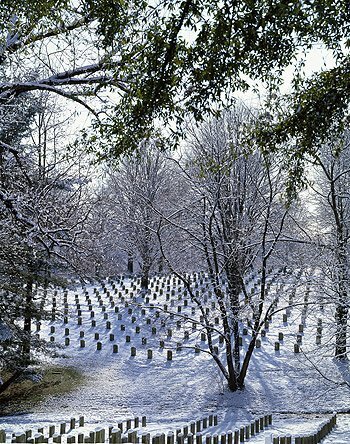 This sobering national military graveyard overlooks the Potomac River from a beautiful hill that’s covered with virgin white oak trees. 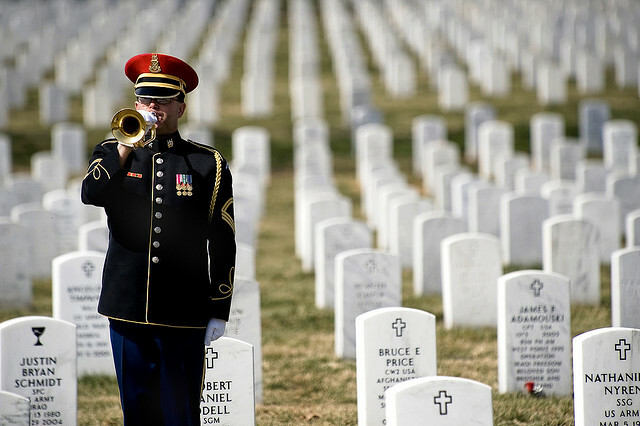 Each year, more than four million visitors walk among the 300,000 or so tombstones of America’s military dead, U.S. statesmen and women, and two U.S. presidents. Another guessing chance. Which presidents? Most Americans would correctly say in a snap: John F. Kennedy, the young national leader who was assassinated in 1963. His wife, Jacqueline, and two of his brothers — former attorney general Robert Kennedy and longtime U.S. senator Edward “Teddy” Kennedy (who died in 2009) — are interred, along with other family members, next to “JFK” in a plot marked by an eternal flame. The second chief executive buried at Arlington was quite the achiever. William Howard Taft served as president and then, some years later, chief justice of the United States Supreme Court. Also at Arlington National Cemetery — which, incidentally, is just one of 120 national cemeteries in 39 states and Puerto Rico — you’ll find the Tomb of the Unknowns. 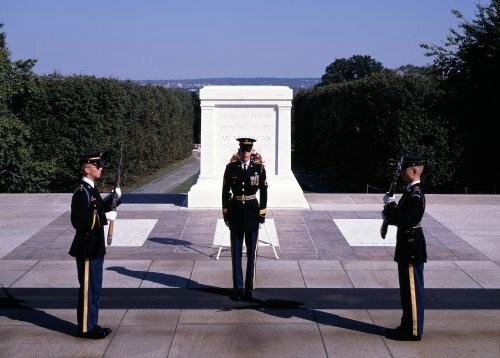 This eternal resting place of four U.S. service men or women from different wars, has been guarded by an army sentinel 24 hours a day since July 1, 1937. The soldier paces 21 steps before the tomb, pauses precisely 21 seconds, and returns, over and over again. Year-round, an average of 28 military funerals — with full ceremonial salute from an honor guard — take place each weekday. Except by the clip-clop of horses pulling caissons carrying caskets along the paved paths of the cemetery and by the barked commands and three cracks of rifle fire at those funerals, the peaceful setting is disturbed only by the chatter of restless kids and the shushing from their parents as they get off passing trolleys, and by the sound of jets heading to and from nearby Reagan National Airport. There is little flapping of flags, since flags are permitted at gravesites only one day each year, in the hours leading up to Memorial Day. 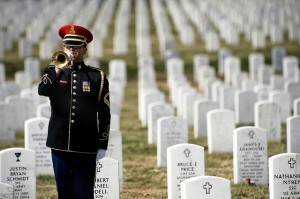 It’s the mournful refrain of “Taps,” played by lone military buglers. “Taps” was written by Union general Daniel Butterfield during an American Civil War battle in 1862. It was meant to signify the end of the day — or “lights out.” Soon, Confederate as well as Union forces were playing it at burial services to signify the end of a soldier’s days on earth. The Arlington site became a cemetery out of necessity. Thousands and thousands of young men — Confederates as well as Union soldiers — were dying in military hospitals in the Washington area. 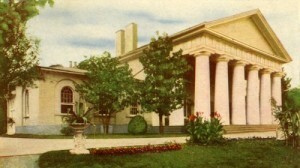 The Union Army had seized the mansion of Confederate commander Robert E. Lee — which the Lee family called “Arlington House” and is now a National Park site commanding the cemetery grounds. With the manor house came 445 hectares of land. Some say that the quartermaster of the Army, General Montgomery Meigs, deliberately ordered soldiers — and about 3,800 former slaves, called “Contrabands” — buried around the mansion to spite Lee, whom Meigs considered a traitor. Although Arlington was officially a Union cemetery at first, there’s a small Confederate section as well. 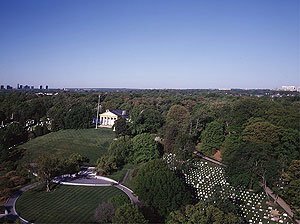 In 1900 and 1901, all of the Confederate soldiers buried in national cemeteries at Alexandria, Virginia, and at the Soldiers’ Home in Washington were brought together with a handful of Confederates already buried at Arlington and reinterred in the special section. Among the 482 southerners buried there are 58 Confederates’ wives, 15 southern civilians, and 12 unknowns. 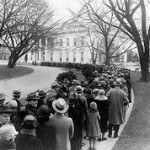 These days, the only people eligible for burial at Arlington are men and women who died on active military duty, won the nation’s highest medals, or were honorably-discharged career-service members — plus their spouses and unmarried children under 21, and a scant few civilians whom Congress approves. Among the interred are three other U.S. chief justices (besides Taft) and many associate justices, and several astronauts and prominent explorers. Throughout this place where solemnity is the byword, flags on poles are flown at half staff from one-half hour before the first funeral until one-half hour after the last ceremony of each day. Contemporaneous. Occurring at the same time that another event is happening. Tags: Arlington National Cemetery, Civil War, U.S. military, Washington D.C.
Blogging IS easy these days — at least the formatting part. 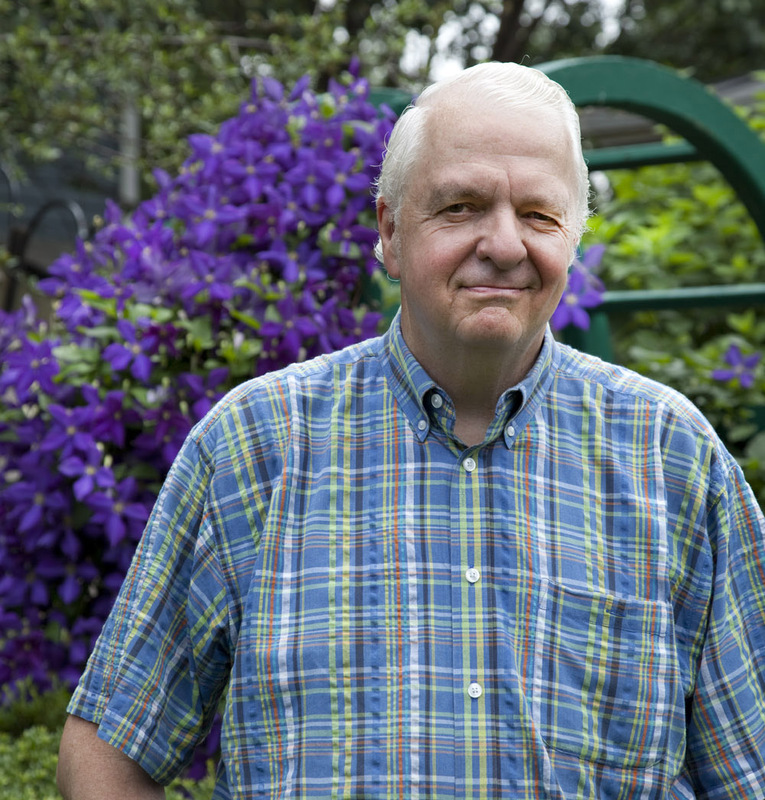 I have had a good deal of help from some expert and creative folks — Dora Mekouar, Dino Beslagic, and Anne Malinee. Anne, in particular had to spend hours a week just tweaking the html code to made some of the features (such as having the photos expand to full screen when you click on them) possible. Now, WordPress does a lot of the work for us without having to fuss with a single html code. There’s still some PhotoShop work occasionally, not to change the content of the photos but to make them large or small enough to fit. And the audio podcast, archiving of the blog and my “Wild Words,” and such take some special talents that Dora and Dino possess. But for the most part, all I have to concentrate on is the research and writing. I’m glad that you like the final result.